The Angry Whopper is back for a limited time at Burger King. A spicy take on the chain's signature burger, the Angry Whopper features a quarter-pound flame-grilled beef patty, thick-cut bacon, American cheese, iceberg lettuce, tomato, crispy onion petals, jalapenos, mayo, and Angry sauce on a toasted sesame seed bun. 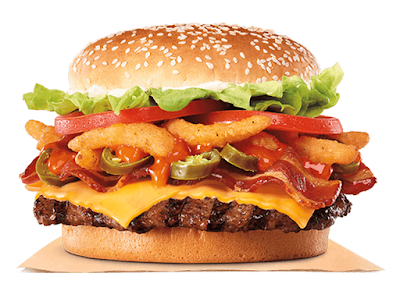 Basically, it's a regular Whopper with Cheese, minus the ketchup and sliced onions, to which they then add bacon, crispy onion petals, jalapenos, and Angry sauce. In the past, the Angry Whopper included a habenero cheese rather than American cheese. Prices vary with location but you're generally looking at $5 or more per Angry Whopper. However, Burger King has a coupon in their mobile app where you can get one for $3 when you order through the app. The offer is good through April 22, 2019.